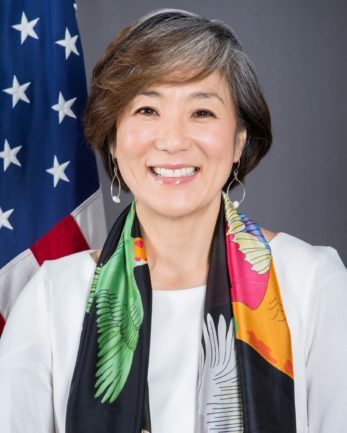 Katelyn Choe has been a career diplomat with the U.S. State Department for 18 years. Her previous tours include South Korea, The Netherlands, Afghanistan, Nepal, and Washington D.C. Her most recent assignment was as the 2018 PyeongChang Winter Olympics Coordinator. During the Winter Olympics, Katelyn worked closely with the Foreign Commercial Service and U.S. companies and corporate sponsors to promote U.S. economic interests and growth. She also organized various cultural exchange programs with Team USA Olympians and local schools to increase dialogue and cultural understanding using universal passion for sports as a way to transcend linguistic and sociocultural differences and bring people together. Katelyn received her Masters Degree in Economic and Political Development from Columbia University School of International and Public Affairs. She is married to a publisher who can do his job and stay happy as long as there is reliable internet and bike paths. She has two children and three rescue dogs but wishes she could have more (dogs, that is). Discussing U.S. policies with New Zealanders is one of the most important things we do; if you would like someone from the Consulate General to speak to your organization, please get in touch with us.